Copenhagen is one of those cities that will make your wallet sigh. 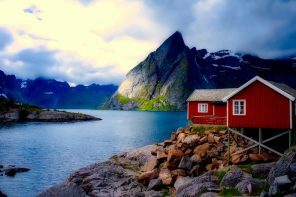 Prices are high compared with most other European capitals, and once you’ve covered all of the basics like food, transport and accommodation, it can be hard to justify splashing even more cash on sightseeing. Yep, Copenhagen is an expensive city to visit. But that doesn’t mean you have to spend your days stuck in your hotel room, feeling sad and lonely. There are masses of completely free things to do, from guided bike tours to summer swims with the locals. And of course, you can always have an audience with the famous Little Mermaid. 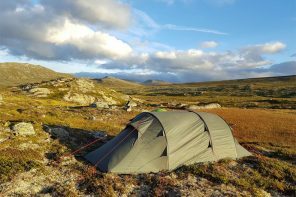 Because no one likes missing out on fun for the sake of a few kroner, we’ve also included some extremely cheap activities in this list (they’re all under 150 DDK). Just use the headings below to hop straight to the section you’re interested in. 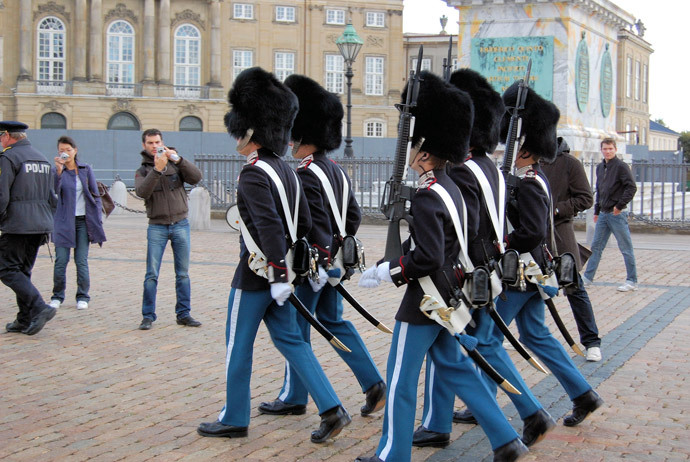 1) See the changing of the guard ceremony at Amalienborg. The square outside the Queen’s house comes alive at noon each day, with soldiers from the Danish Royal Guard stomping their feet, crashing cymbals and wearing silly hats. 2) Go to church. Completed in 1894, Frederiks Kirke (or the marble church, as locals know it) looks like a mini version of St Peter’s Basilica in Rome. Well, maybe mini is the wrong word; the huge copper-clad dome here is the biggest in Scandinavia. It’s free to take a look around the church itself but you’ll have to pay if you want to visit the tower (see here for details). 3) Pay your respects to local heroes like Hans Christian Andersen at Assistens Cemetery, a leafy park that doubles as a burial ground for some of Denmark’s most famous people. 4) Snap pictures of the bright yellow row houses in Nyboder, just south of Østerport train station. This district was first planned in the 1600s to help house local sailors. The buildings, which are lined up in neat rows, are still in use today. 5) Visit the world’s oldest amusement park. Bakken is a 20-minute train ride from the city centre and although you have to pay to use the rides, it’s completely free to soak up the nostalgic atmosphere and browse the independent shops. 6) Listen to free classical music. Trinitatis Kirke is a nice 17th-century church in the city centre with an impressive gilded interior. It regularly puts on free classical concerts (Fridays and Wednesdays seem to be the most popular days, but check ahead). 7) See a free film under the stars. Each summer, thousands flock to Fælledparken with drinks and snacks to see late-night movies on a big screen. The dates for Zulu Sommerbio change each year, but the screenings normally take place on six consecutive nights in August. 8) Go to the theatre. Okay, you won’t get into the main performances without paying, but there are often free shows in the foyer at Skuespilhuset. See the Royal Danish Theatre’s online calendar for up-to-date info. 10) See Egyptian mummies, Greek sculptures and sparkly Viking gold at the National Museum of Denmark. 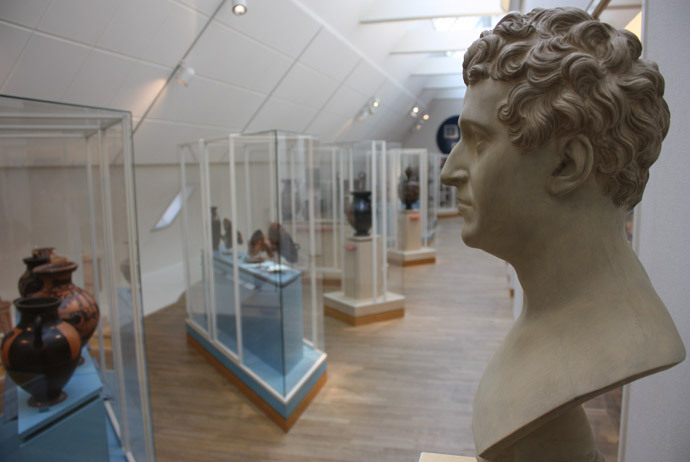 You could easily spend half a day wandering through the galleries here. Admission is 85 DKK. 11) Marvel at how wealthy beer can make one man on a visit to Glyptoteket, a unique collection of art and antiquities amassed by one of the early bosses of the Carlsberg brewery. It opened to the public back in 1882. Admission is usually 115 DKK but you can visit for free on Tuesdays. 12) Get to grips with masterpieces from the Danish Golden Age at the Hirschsprung Museum, just north of Statens Museum for Kunst (see above). This collection costs 85 DKK to look around. 13) Discover why a Danish sculptor called Bertel Thorvaldsen found international fame and even ended up creating works of art for the Pope. 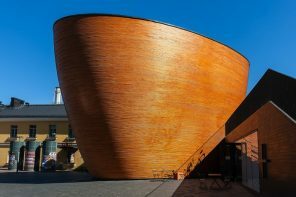 The museum dedicated to his work is housed in a gorgeous yellow building near Christiansborg Palace, and it opens for free on Wednesdays (normally 70 DKK). 14) Learn about Denmark’s involvement in violent conflicts (centuries ago and much more recently) at the Royal Danish Arsenal Museum. Along with weapons and stories from the battlefield, you’ll find a nifty collection of military uniforms. Entry is 75 DKK. 15) Visit an old textile factory in the countryside to see how Denmark became industrialised. Brede Værk costs 50 DKK to visit, but it takes about half an hour to get there from central Copenhagen; take an S-train to Jægersborg, and then a local train to Brede. 16) Kick back in Rosenberg Castle Gardens. Set around a 400-year-old castle, these neatly clipped gardens provide the perfect place to have a picnic or just enjoy a little rest while sightseeing. The gardens are free to visit, but the castle itself charges an admission fee. 17) Escape the city at Jægersborg Dyrehave, a 1000-hectare park that’s home to cycle trails, the Bakken amusement park (see above), and around 2000 free-roaming deer. 18) See orchids, palms, cactuses and giant lily pads at Copenhagen’s botanical gardens, which are home to a series of free-to-visit glasshouses. 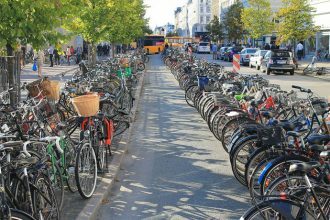 19) Hire a city bike and explore the suburbs. 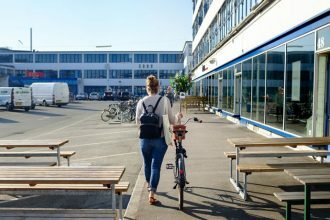 It’s not completely free but it is very cheap – for just 30 DKK an hour you can borrow one of Copenhagen’s high-tech public bikes, which come equipped with tablet computers, GPS systems and even assisted pedalling. 20) Hit the beach. 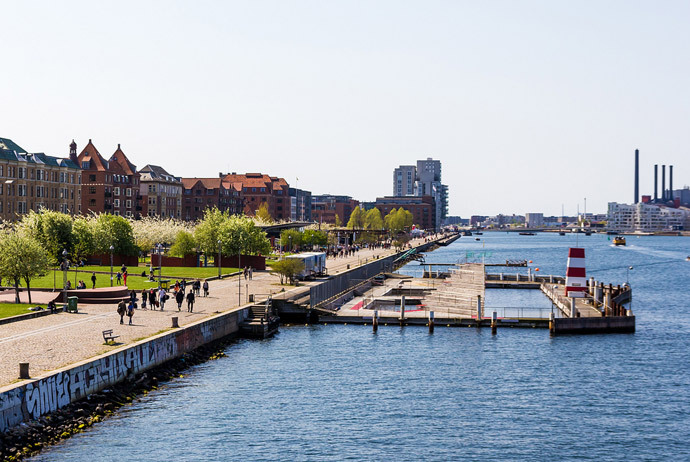 There are a couple of pretty beaches within cycling distance of the city centre, including Amager Strand, where locals come to sunbathe, try kite boarding and (when it’s warm enough) go swimming. 21) See what life used to be like for Denmark’s poorest farmers at Frilandsmuseet, an open-air museum with dozens of historic buildings. 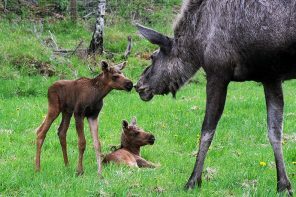 It costs 75 DKK to visit (90 DKK during the summer holidays) and you’ll need to use public transport to get there: take the train from Nørreport to Sorgenfri (20 minutes) and walk the last 700 metres or so to the entrance. 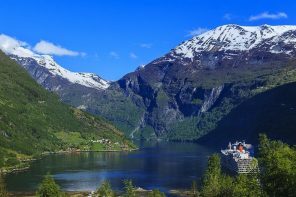 22) Visit Sweden. Malmö is a great little city, and it’s just across the bridge. Here’s how you get there in the cheapest way possible. 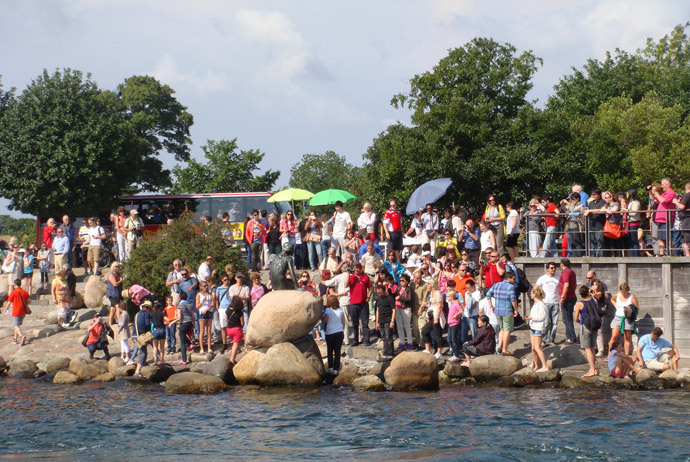 23) Take a dip at Havnebadet Islands Brygge. 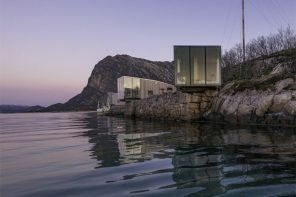 The open-air pool (summer only) is completely free to visit and has decent views across the water. Expect crowds on sunny days. 24) Join the locals for a training session. Nordic gym chain Friskis & Svettis organises free outdoor keep-fit classes in Fælledparken every Monday, Wednesday and Friday during in summer. The fun kicks off at 5.30pm. 25) Pound the pavements. Local running clubs like NBRO meet on a regular basis. 26) Go for a skate. 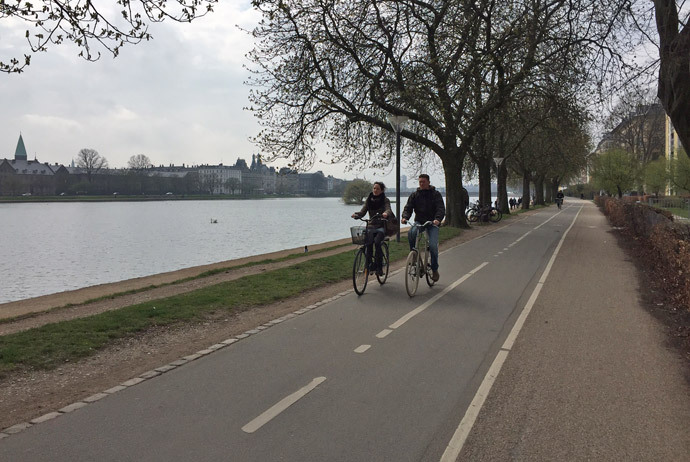 Copenhagen’s cycle paths double as safe places to inline or skateboard (though make sure you don’t get in the way of local cyclists). Otherwise, head to the skate park at Fælledparken, which has rails, bowls and a mean-looking half pipe. 27) Try Copenhagen’s first interactive running route. The track at Søndermarken is free 24/7 and uses lights and a computer system to help runners beat their personal bests. 28) Take a free walking tour. 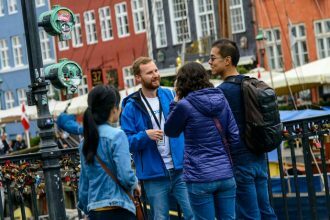 There are two main companies offering free walking tours around the city centre: Sandemans and Copenhagen Free Walking Tours. Guides from both companies work for tips. Prefer a private tour? Try these great options. 29) Hop on a guided bike tour. 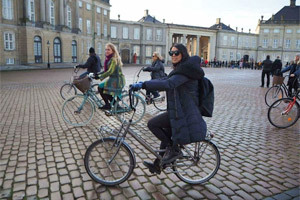 If you’re travelling with at least two friends or family members you can book a private two-wheeled tour of the city for less than 300 DKK each. 30) Climb the tower at Christiansborg Palace for free views over the city. There’s not a great deal of space at the top, so go early if you want to avoid queues. 31) Get dizzy at Rundetaarn, an astronomical observatory from the 17th century. A spiral-shaped slope makes seven and a half turns on its way up to the top, where you can get a cracking view over Copenhagen’s rooftops. Entry is 25 DKK. 32) See the Little Mermaid. 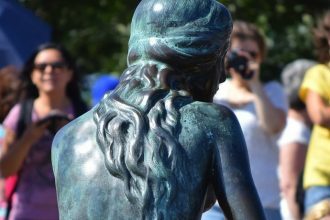 No round up of free things to do in Copenhagen would be complete without mentioning the Little Mermaid statue. It’s actually pretty underwhelming and there are often so many tourists clambering about all over the place that you can’t even get a decent look at it. However, you’re in Copenhagen, so you have to try anyway. The views across the water from here are pleasant enough, too. 33) Admire the famous Öresund Bridge from the top of Frederiks Kirke (see above). This guide tells you how to cross the bridge. 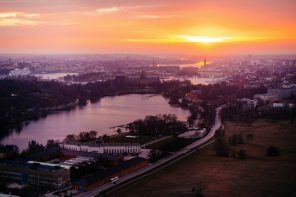 The 35 DKK admission fee will also give you a bird’s-eye view of Amalienborg. 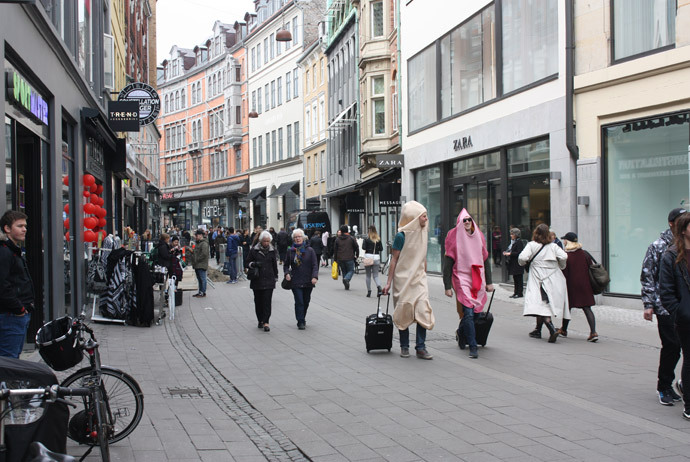 34) Get a taste for Danish design with a walk along Strøget, the city’s main shopping street. And it isn’t just design here; Danish brands like Trollbeads and Bang & Olufsen also have stores along the kilometre-long street. 35) Browse for bargains at the antiques market that sets up on Halmtorvet every Saturday morning from April–October. 36) Find unique souvenirs at Den Blå Hal, a big, super-popular indoor flea market that takes place every weekend at Amagerbanen 9. 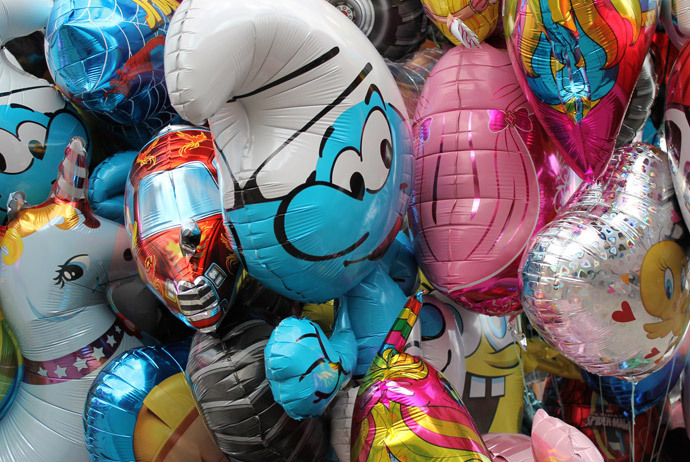 Entry is 10 DKK and the market runs from 10am–4pm. 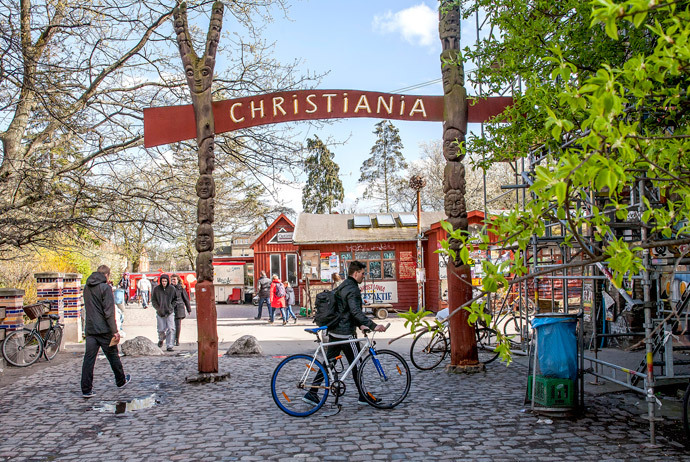 37) Follow your nose to Christiania’s ‘green light district’, where weed is sold and smoked openly. Even if you don’t want to smoke, it’s an interesting part of town to explore – just keep your camera in your bag, as photos are banned on the main drag, Pusher Street. 38) Admire the city’s modern architecture. Don’t miss the controversial opera house or Den Blå Planet, Denmark’s national aquarium. 39) Sip coffee as you admire handmade, vintage bikes at WeCycle. This cool coffee shop lets you enjoy two of Denmark’s biggest passions – bikes and coffee – in a nice cosy environment. Need something stronger? It also sells decent Danish beer. The café is at Bremerholm 18. 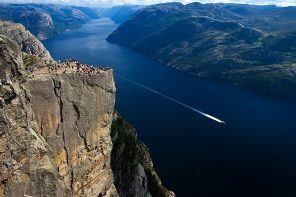 40) Get a new perspective on the city by taking a public ferry. The journey from Nordre Toldbod to Det Kongelige Bibliotek costs just 24 DKK and will help you get your bearings. 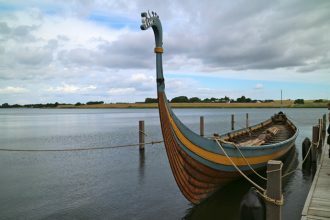 The timetable for the waterbus is here (in Danish only). 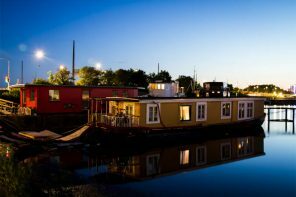 41) Hire a green boat. GoBoat has dinky solar-powered vessels available by the hour, complete with on-board dining tables and optional supplies of Carlsberg. You’ll need a group to keep this cheap – if you can pull together a total of eight friends, the price goes down to around 50 DKK per person. 42) Take a stroll along the waterfront at Havnepromenade. Look across to the far side and you might just spot the brick building that houses Noma. 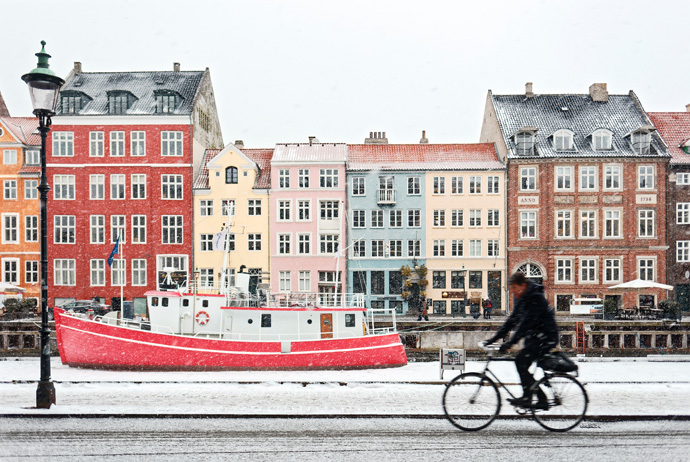 43) Soak up the atmosphere at Copenhagen’s most famous harbour area, Nyhavn. The bars here are expensive, thanks in part to the number of tourists passing through, but there’s nothing to stop you grabbing a cheap beer from a local shop and enjoying the exact same vibe. 44) Eat for free. The Byhøst website shows where edible goodies are growing wild across Denmark, and there’s a surprising amount of free food to be found in and around Copenhagen. The site is only available in Danish, but you can still make use of the map. 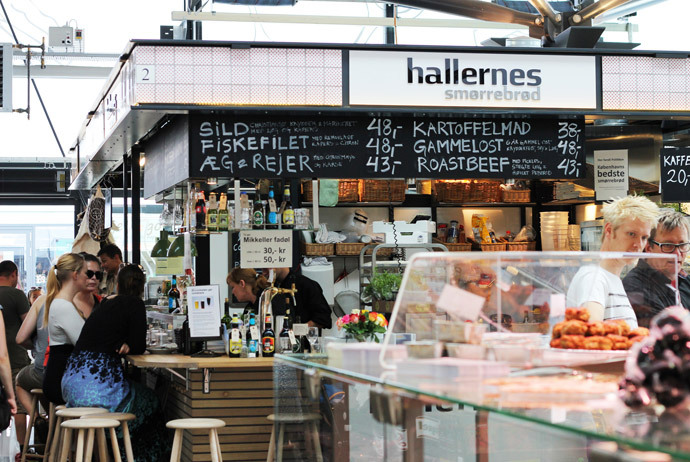 45) Drop into one of Copenhagen’s indoor food markets, like Torvehallerne, where free samples are often handed out. Failing that, try the street food. Trucks are dotted around the city, serving everything from classic hot dogs to modern Asian food at knockdown prices. 46) Have a picnic. Stock up on ingredients at budget Danish supermarket Netto (there’s a branch near Rundetaarn in the city centre) and head to one of the city’s best parks. 47) Fill up on cheap and delicious smörrebrød. There’s more info on the best places to get this authentic Danish snack in our guide to eating cheaply in Copenhagen. 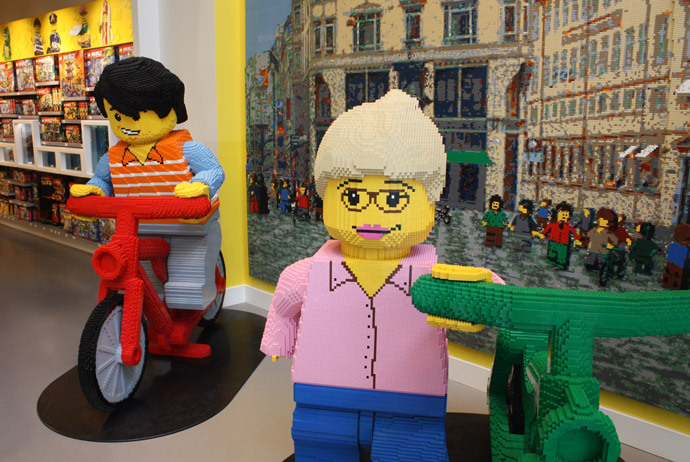 48) Visit the huge Lego store on Strøget, Copenhagen’s main shopping street. 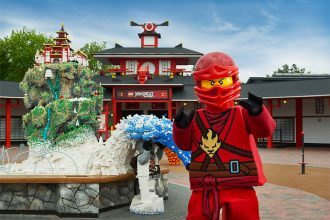 Apart from giant Lego models and a kids’ play area that dads also seem to love, this place also stocks rare Lego sets that are hard to track down elsewhere. 49) Feed the ducks on Copenhagen’s waterways. Actually, don’t: twitchers say bread could be harmful to the little feathered creatures and their lakes. 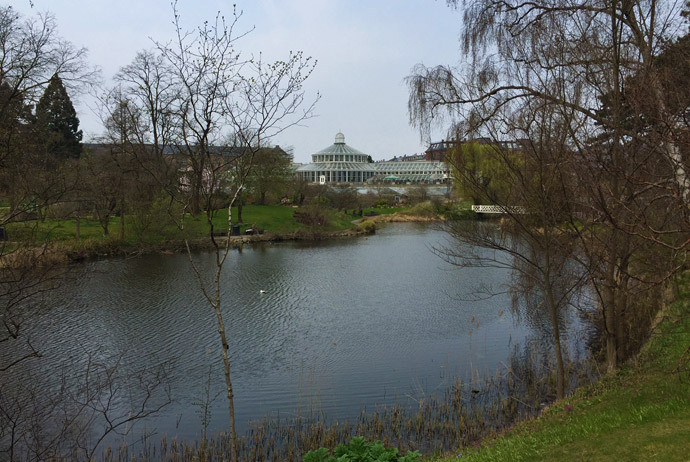 But there’s nothing to stop you taking the kids for a look at the birds anyway – try Frederiksberg Have, which has tree-shaded pathways edging the water. 50) Let off some steam at the Guldbergs Plads play area in Nørrebro. It was actually designed to get adults moving, but older kids will love clambering around on the brightly coloured poles and swings. 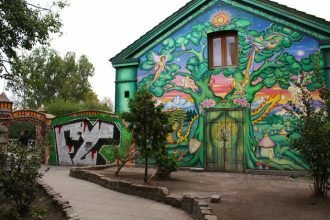 51) Explore Nørrebro, Copenhagen’s coolest neighbourhood, on foot. There are loads of vintage shops, parks and bars to enjoy on the cheap. I must say this is quite a detailed list of the best free n cheap things to do. It helped a lot. Thanks.